Breakfast – The Most Important Meal of the Day!!! Ever since I had seen the Sabudana Khichadi pic by Rushab’s I was eager to try the service. I am a BIG sabudana fan & love the khichadi, vada, thaalipeeth, etc. But due to my parent’s health, we have stopped preparing sabudana dishes at home. And honestly, I don’t quite like the khichadi you get in restaurants. But majboori main khaa leti hoon. When I tried placing the order for a khichadi myself, I was unable to do it due to some tech issues. Soon the owner reached out & my family & I had an opportunity to taste few dishes. Packed in BK branded boxes, the food was delivered without any spillage. We started with Thaalipeeth served wrapped in a silver foil. Made with the multigrain flour in the traditional way – with a hole in between & served with peanut & curd chutney. Unlike we make it at home, this was small, a little thick & soft. Let me just say – We are very partial towards our thaalipeeth & have extremely high-standards. 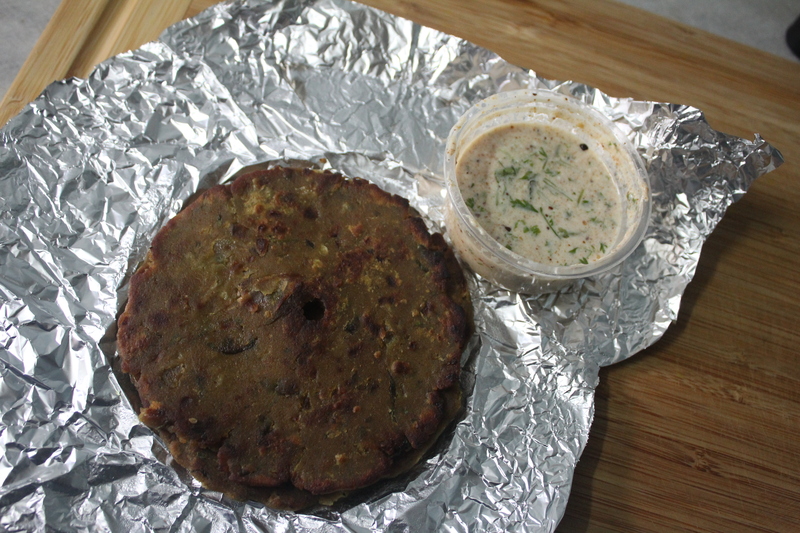 Having said that, this thaalipeeth is way-way better than the ones you get any maharashtrian restaurants. What I loved the most was the chutney served along with it. Dahi & Shengdana mixed with few spices – simple yet really awesome. Then was my fav Sabudana Khichadi. Just the way I like it – Soft with each grain separate. A little bland for my taste, this was topped with fried potatoes, peanuts & loads of grated coconut. I thoroughly enjoyed it. So much better than the sticky khichadi you get everywhere else. Well I don’t usually eat Granola when served at breakfast buffets when I am travelling. But Sucheta had strongly recommended the Granola from these guys. 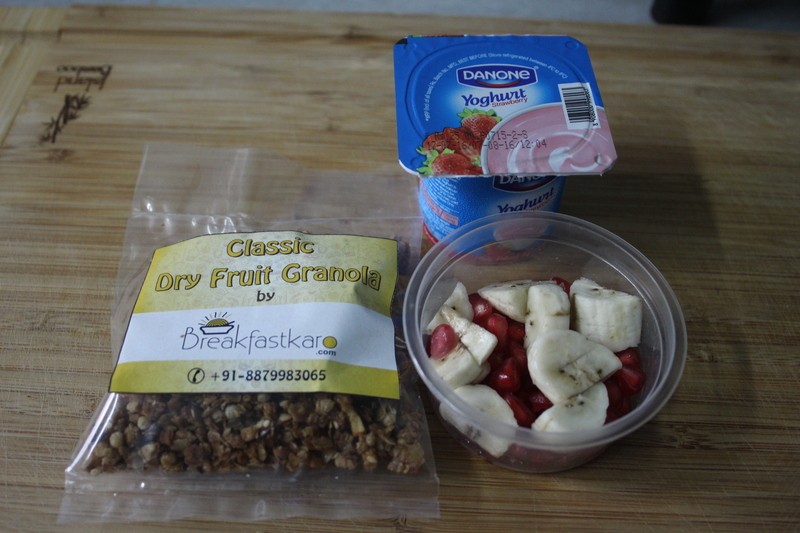 Made with oats, dryfruits, flax seeds, etc this was one GOOD Granola. Served with strawberry curd & fresh cut fruits, I ate all of them separately. Apologies for not clicking the picture. Last but not the least, served in a glass bottle was kokum shurbet. Neither too sweet nor tangy, this was fresh & good. My dad is a big kokum fan & he loved it. 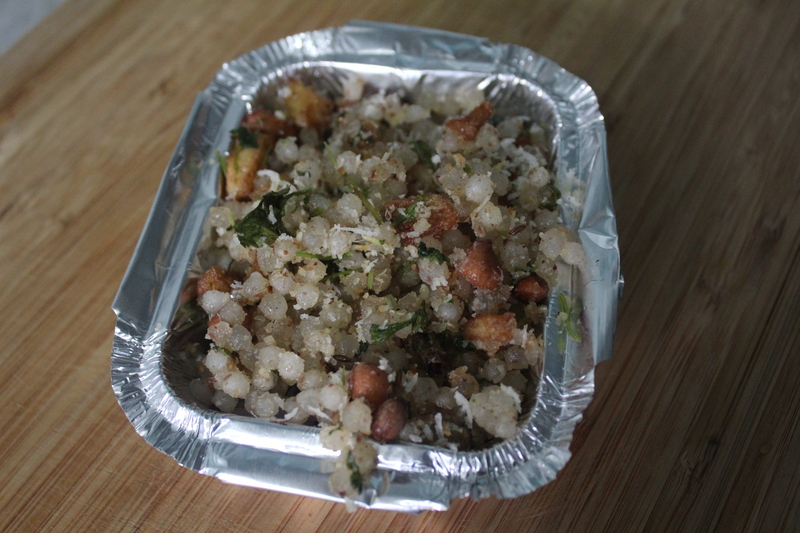 www.breakfastkaro.com will be my choice when I crave for Sabudana Khichadi in the comforts of my home. BTW I am calling for my stock of Granola as well 🙂 Its the perfect snack for that in-between meal craving.